In the summer of 2015, so more than a year ago, the municipality that I live in announced they were selling commemorative bricks that would be installed in a city square just down the block from where I live. People who bought said bricks could get a small amount of text personalized on the brick itself. The bricks cost $200 each but were tax deductible. I bought one of the bricks and had a humourous (to me at least) but acceptable phrase on my brick. The bricks were scheduled to be completely installed by February 8, 2016 with work actually starting at the beginning of 2016. When January of 2016 rolled around, I saw no work at all being done at the city square. I phoned city hall and was told that due to scheduling problems, the bricks weren’t going to be installed until after the summer of 2016, probably October 2016. Well, the month of October ends this week and I was just at the city square today and there are no bricks. Just last Monday, I decided to call city hall information line to see if a more general department had any answers. Someone did answer my call but said that they didn’t have any specific information for me but they’d track down someone who would have answers. That person would then get in touch with me. I left my contact info with city hall. The entire week went by and no one has contacted me. I feel like there’s more to this story than I’ve been told (which is very little) and I believe I’ve been purposely deflected from finding out the truth. I paid $200 for something and I did not get what I expected by paying that money. I’m not getting any answers and I won’t rest until I do. I’m going to chase this up to the highest levels if I need to do. Boy, I sure hope this isn’t one of those things that takes down a mayor. Well, I gotta do what I gotta do. Conan and Steven might be joking about Steven’s employment status in the above skit but let’s keep in mind that Steven’s parents fall into the traditional Asian parents category. If I know traditional Asian parents, and believe me I do, they are quietly worried about their son getting another steady acting gig. I’ve mentioned this many times before because it’s been a source of entertainment for years but I have an ISP-based e-mail account that I don’t use. I’m sure everyone is aware that when you sign up with your ISP they usually give you a free e-mail account. With the advent of Gmail and other similar services, ISP e-mail accounts are rarely used these days. The only people that use them now are old people who never migrated to the new hotness. I check my ISP e-mail account every few weeks to see what messages I get. Over the years, people have mistakenly sent me stuff because they think they have my e-mail address when they don’t. Well, I got a series of interesting messages over the last few days. A mortgage broker sent me several documents about a house sale and the mortgage some people took out to pay for the house. I got all the names, details, and dates about the transaction. The property is a house and it is in Langley, a suburb that’s about an hour’s drive east of Vancouver. The house is over 40 years old, 4 bedrooms, 3 bathrooms, and is over 2000 sq. feet. I managed to pull up an old listing for it and it was listed at just over $700,000. The mortgage is for just under $600,000. I don’t know the actual price they paid for the house though, so it’s difficult to tell how much they put down. The mortgage is a fixed rate at 2.49% for five years, amortized over 30 years. There are three people listed on the mortgage and the monthly payments are about $2300. My mortgage payments are about $500 a month, so a payment that large scares the crap out of me. Then again, I don’t live in a house. Do I reply to the mortgage broker and say they have the wrong person? There several other people on the recipient list so it’s not like no one got the documents. I think I’ll just leave it alone. It’s not like I can do anything with this info anyways. So I know how much a mortgage is? Sure these are personal details but there’s nothing untoward that I can do with such details. When I check the e-mail account in a few weeks again, I’ll let you know if I get another interesting message. Last week, EA released Battlefield 1, the highly anticipated next installment in the Battlefield series. It might seem weird that is the fifteenth game in the franchise but has the number “1” in the title. It’s probably due to the World War I setting. Anyways, the game came out last week. At our studio, we have a store for employees where we can purchase EA at a discount. The Xbox One and PlayStation 4 versions of Battlefield 1 were available early last week. The PC version of the game was not available because of a delay in shipping. Now that might seem like a reasonable thing to deal with until you discover what exactly is shipped with the PC version of the game. A reasonable person might think that the PC version contains a plastic case, a small sheet of info, and most importantly the disc or discs. That’s where a reasonable person would be wrong. It started last year but EA stopped pressing discs for virtually all the PC versions of their games. At first, they kept the familiar plastic case. Inside the case was a code that you would enter online which would entitle you to whatever game you bought. I hated this development because I’d have to go home and then download gigs upon gigs of data to play the game. I’m old school and I like installing my games from disc. Anyways, back to the shipment of the PC version of Battlefield 1. We were waiting for just the codes, not a physical disc or anything. Like how stupid is that? We were going to have to take these codes and enter them online anyways, so why don’t they just send the codes via the Internet? Well, the stupid codes finally arrived today at 3pm. Everyone lined up at the store to receive a card, slightly bigger than a credit card. On the back was an area you could scratch off, which hid the redemption code for the game. A lot of people I knew took the card back to their desk, scratched off the area, redeemed the game online and then threw the card in the garbage. We waited almost an entire week, enduring the shipment delay so that we could physically get a card that contained an online code that we immediately redeemed online anyways. It really boggles my mind how stupid that is. In the future, all of this should be done online. We should be able to pay for the code online and get it immediately. Let’s just skip the stupid part of printing out those useless cards. I am definitely going e-mail the store tomorrow. 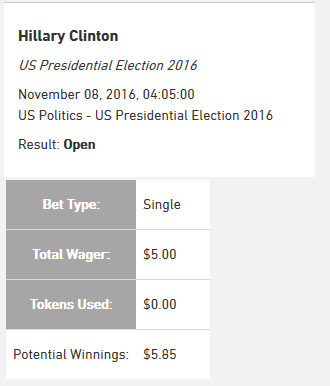 After talking about it a lot, I finally put some money down on the election. Normally losing five dollars isn’t the end of the world but in this case, that might actually be true. You know it’s a good weekend when you have to spend about an hour of your Saturday afternoon in the dentist’s chair. After bugging me for several months about some fillings they wanted done, I relented to my dentist’s office nagging. I had three fillings done at once which sounds pretty terrible except that two of them were quite minor. Only one required actual numbing and drilling. The other two were from grooves or a pit from tooth brushing. The dentist went in and just filled in the spots since there was no actual decay. Still, no matter how minor a procedure, it’s never fun going to the dentist. Not only is it not fun, you also get to pay for the privilege of not having fun. The whole process cost just under $600 which luckily my dental coverage paid for about $500. Then once I got out of the chair, I had the pleasure of waiting for the local anesthesia to wear off. I hungry but I waited until most of the numbness went away because I didn’t want to chew my tongue off and not notice. Well, let’s hope I don’t have to deal with that again for a while. I’ve noticed an interesting phenomenon that occurs when a video game studio shuts down or when a studio layoffs a whole bunch of people. Recruiters from recruiting companies swarm towards the employees that are effected. I suppose some of these people genuinely mean well and want to help. Let’s face it though, recruiters get paid when they place people. They don’t do it purely out of the goodness of their heart. I find that some recruiters though use a shotgun approach without doing any research at all. Since UFG closed on Monday, I’ve received a large uptick of activity on LinkedIn, the social platform for business. I’ve received two messages and several invitations to connect. That may not seem like a lot but I go weeks without any activity normally. I’m guessing this is happening because I have United Front Games in my list of prior positions. The odd thing is, I also have my current position listed, which states I’m gainfully employed at EA. My time at UFG is listed clearly in the past too. I can only theorize that some of these recruiters just send a ton of messages to anyone who have UFG listed in their profile, no matter when they worked for them. I’m increasingly dismayed at how impersonal external technical recruiters have become. Yesterday I wrote a post about the closing down of United Front Games. I want to address something that I left out in that post. Over the years, I know that UFG received a lot of criticism for not making a sequel to their most successful and well-known game, Sleeping Dogs. People called for a sequel for years on end. The people at UFG were not idiots, they heard the fans loud and clear. UFG themselves would have loved to make a sequel. To understand why that never happened, we need to go back and examine the sequence of events that went from Activision canceling True Crime: Hong Kong to Square Enix picking up the development costs to help finish what eventually became Sleeping Dogs. When Activision bailed on the game, it left UFG in a bad situation. There were mass layoffs and while Activision left UFG the rights to most of the code and the assets, they still had to find a publisher and someone who could fund the rest of the development. The game was shopped around to various publishers and eventually Square Enix stepped in and a deal was brokered. I’m obviously not privy to all the details but it’s clear to me that Square Enix got some very favourable terms as UFG was not in a great bargaining positions. One of the concessions they had to make was the Sleeping Dogs intellectual property would belong to Square Enix. In return, UFG received the money they needed to finish the game. The important thing to note here is that UFG did not control the IP. They couldn’t make anything Sleeping Dogs related without the consent of Square Enix. As the publisher, Square Enix also controlled the money too. So UFG could have wanted to make a sequel more than anything in the world but if Square Enix decided they didn’t want to spend the money, then UFG was stuck with no where to go. This is the reason the public got the ill-fated Triad Wars, the free-to-play game that was set in the Sleeping Dogs universe but wasn’t really the game that the gaming public even asked for. Square Enix was willing to give just a tiny bit of money to develop a free-to-play game instead of the full-fledged, open-world sequel that everyone wanted. If the gaming public at large wants to rightfully blame someone for not letting them have Sleeping Dogs 2, they should blame Square Enix. They still hold the rights to that IP and I feel confident they will never ever make another game in universe again. 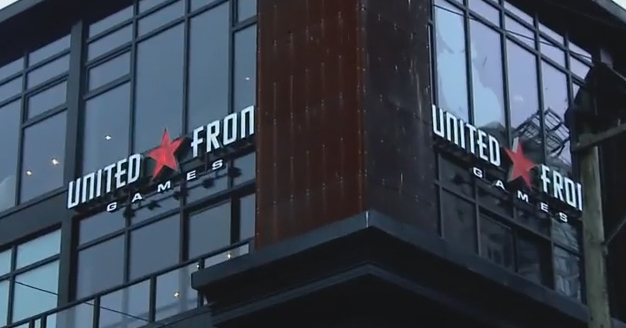 On Monday, United Front Games, a studio that I worked for on two different occasions shut their doors unexpectedly, putting many game developers out of work. It’s always sad when a video game studio goes out of business but UFG will always hold a special place in my heart. In late 2010 my career was at a crossroads as EA had moved my beloved Black Box studio to Burnaby from our awesome downtown location. EA had also decided to not proceed with another skate game beyond the third, instead pushing me to a game team I had no interest in working on. I wanted to work back downtown and I knew that I had prepare to leave either voluntarily or not. My first choice, by a wide margin was to go to United Front Games. In less than three years they had developed a reputation that made me want to be a part of their crew. They had secured a prime location in the heart of Yaletown, atop of a brew pub and restaurant. Ironically, it was this location that EA wanted to move our skate team to before the recession scared them off. Instead UFG took it over and made into one of the best looking studio spaces in the city. They also had secured two publishing contracts, both with big names: Sony and Activision. For an independent studio to have two teams working simultaneously on high profile games was impressive, especially in the recessionary days of post-2008. More importantly, they had a studio culture that was unlike anything I had seen or heard about. They were cool without being “too cool for school”. They knew how to have fun and in a weird way they were kinda serious about having fun, if that makes any sense. The combination of the studio space, location, culture, and the games they were working on all made it my number one place to work at if I had to leave EA. In October 2010, EA made my choice for me as they laid me off. Two months later, in December, I had accepted a six-month contract to work at UFG to help them complete True Crime: Hong Kong. I remember I started work at UFG on the day the game was supposed to go alpha, which is to say it was hectic day in a game’s milestone timeline. My desk was right next to a guy named Nigel, who I had worked with years ago and who I got along really well. We eventually wound up having a shot of alcohol in the park next to the studio every single day as our “coffee break” but that’s not the focus of this post. A lot of times when you finally start to work at a job and a company, you discover your expectations don’t exactly meet up with reality. That can lead to disappointment but I can say that there were no disappointments when I started at UFG. The studio space was as great as I thought it would be. The people were as warm and friendly as I expected them to be. The game I was working on was at cool as I thought it should be. Unfortunately for UFG, the game was cancelled by Activision less than three months into my contract. Through no fault of the studio, lots of people lost their jobs because of that decision. My contract was cut short but I didn’t have any bad feelings. I got my wish to work at UFG, even if it was too short of a time. UFG did finally get a chance to finish the game, this time in the form of Sleeping Dogs. I’m very proud to have worked on that game. Even better, UFG was nice enough to include me in the credits even though I wasn’t able to return to the company to finish the game. My second and much longer stint at UFG began in March of 2014. I was in a desperate situation to leave a terrible job. I was asking around to see if there were any openings anywhere. A friend told me that UFG was looking for a contract role to be filled. The project turned out to be Halo: The Master Chief Collection. Fortunately for me, I was working just down the street from UFG at the time so I told everyone I was taking a slightly longer lunch and walked the five minutes to UFG to have my interview. It was great seeing everyone again and they were nice enough to offer me the contract. I worked on Halo from March to October of 2014 which meant I got to work in Yaletown for the summer which was just awesome. The sunny lunches on the various patios with the views of the water or pretty ladies was hard to beat. The eight month contract allowed me to get to know a lot more people than before. Though it certainly was a trying project to work on, that was filled with adversity, I did enjoy being an employee of United Front Games. It was the experience I was looking for way back in 2010 when I was looking for a change. Not everyone who worked for UFG will share my sentiments but many will say good things about their time there. It was a special place and I’m sad that it’s now gone. I am grateful however that I got two chances to work there. I won’t forget that. Normally I’m not in the habit of showing my readers bank commercials but I’ll make an exception this one time. On the surface, this might seem like a boring commercial featuring a Mom opening a bank account while talking to her son but there’s more to it than that. The son is played by Gaten Matarazzo, now best known for his role as Dustin on the Netflix series Stranger Things. I’m guessing he probably booked this commercial just after he finished filming the series as there’s no way he’d probably do a small-scale ad like this anymore. BMO probably got him while he was cheap and I bet he can command much higher fees now that he’s famous. A little bit of trivia, the Mom is played by Katie Griffin, who is recognized in the anime world for her voice over work as Sailor Mars.